It doesn’t matter. If you could have heard Eilish singing “Bad Guy” and “Bury a Friend,” from her album When We All Fall Asleep, Where Do We Go?, as I just did, you would understand: Billie Eilish is on her way to being the 21st Century’s first great chanteuse. 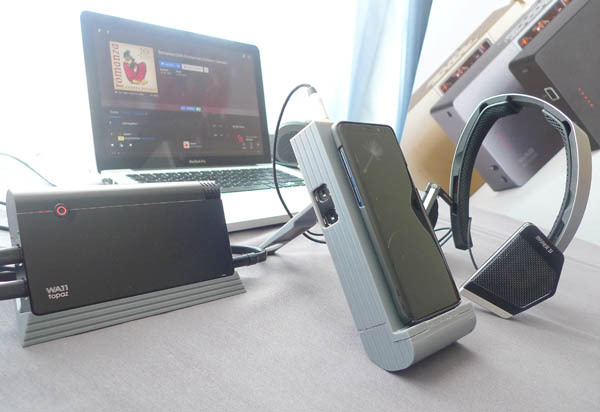 Billie Eilish’s moody, exotic vocals were perfectly matched to what I consider one of this century’s most elegant and resolving headphone systems: Woo Audio’s new WA11 Topaz portable headphone amplifier-digital converter ($1399), here used only as a DAC to feed Woo Audio’s WA33 state-of-the-art headphone amplifier (from $7999), itself driving (alternatively) the $4000 JPS Labs Dianna Phi headphones and Woo Audio’s radical new Mysphere 3.1 headphones ($3999), with all cables by JPS Labs. The Topaz is up for review, so all I will say here is: This level of high fidelity is relatively unprecedented.